An estimated 1 million people flooded the streets of central London this Saturday in favour of a final say on Brexit, making it one of the biggest protests in British history. Calling for a “People’s Vote”, which would allow voters to choose how the UK exits the European Union together with the option for the country to remain a member, protesters expressed their opinion with a multitude of super signs. In stark contrast to the tiny Leaver protests, which rarely number more than a few hundred, this protest was reported by police to be violence-free, with a party atmosphere. 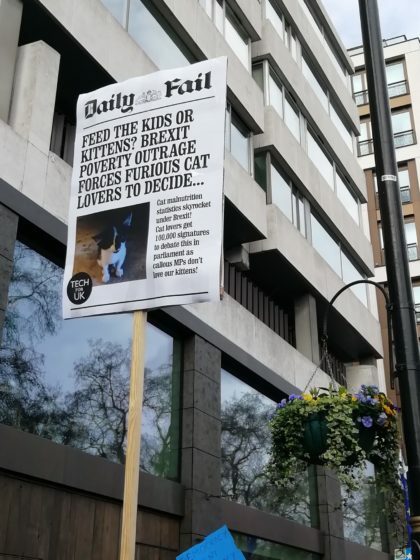 The placards on display reinforced this showcasing just how wonderfully creative and hilariously funny Remainers can be. To see for yourself, check out 48 of the best below. It totally befuddles me why a nation such as the UK is tearing itself apart and wanting to retreat into some minor player of the coast of Europe. There was a time the UK was self assured of their influence in Europe….and Europe for the most part was better for it. So proud to have been there today amongst 1 million peaceful caring people. Absolutely amazing. This is about the future of my children. This is what my Father fought for in WW2. To keep peace in Europe. To move forward not backwards. Proud of all of those who support what is right and to rub shoulders today with such great people. I heard 40% of the people in this march today weren’t even in the UK. This march was rigged. They were getting bots to march for them. I bet they’re not even on the electoral roll, just googling UK postcodes! Love the Pride and Prejudice one. Well clever as well as hilarious. I’d accept the leave vote if there hadn’t been so much underhanded cheating and lies. It’s like being in the egg and spoon race and the winner glued his egg to the spoon and hard boiled it first. Love Old fogies against Brexit! Because we must remember a trend is not an absolute! Fantastic signs, wish I could have been there. One quibble, “biggus dickus” should really surely have been “smallus dickus” for obvious reasons. Sign the “revoke article 50” petition now! The people did decide 17 Million plus of them did. Was an amazing experience, met loads of wonderful people, all wanting the best outcome for the U.K. and their families. Police and organisers did a fabulous job too: Looking for the great in Great Britain Need look no further. Well if 17 million people decided 3 years ago…. don’t you think times have changed… and folks have informed themselves, and watched Parliament implode! Plus there’s a new load of 18 year olds well pissed at the mess those 17 million have got us into ! Nothing is written in stone ! Nothing . That was then, this is now ! Err Sharky 37% voted leabe (aka a minority). To work out how many weren’t persuaded to vote leave just subtract this number from 100. 100-37=63% So the majority decided. .. no leave. But almost 17 million voted to remain but no one is listening to them. They still get a say how we leave IF we leave. Glad you all had a nice day out in London.